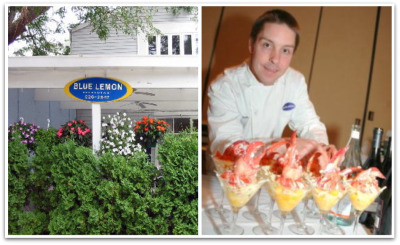 June 17: Guest chef, Bryan Malcarney of Blue Lemon, Westport. Bryan Malcarney of Blue Lemon, Westport will be offering his cold, cucumber dill soup to shoppers at the Westport Farmers Market on Thursday, June 17. He has sourced firm, sweet cukes from Roses's Berry Farm in South Glastonbury and plucked his dill from another farmer's stall. His soup is composed of these local cucumbers supported by a few white potatoes, some stalks of celery, a splash of tarragon vinegar, fresh dill and squeezed lemon juice. Malcarney loves to roam this market. In response to what he finds there, he creates a weekly market special at Blue Lemon every Thursday evening. He will be posting his inspired special on facebook every Thursday afternoon to inform his followers. Last week he offered local, organic, field greens with fresh goat cheese, tiny, sweet strawberries, lightly dressed in a strawberry vinaigrette. He also picked up some local goat milk for his Dad, who makes his own goat cheese (sorry, it remains in the private stash). He has his eye on those local sausages so check Facebook on Thursdays and you will probably catch a market inspired sausage special soon. Blue Lemon's menu changes seasonally as Malcarney seeks to source as much as possible from local growers. He is waiting for the green beans and CT corn. He isn't the only one! The cold cucumber and dill soup will be ready to sample when the market opens at 10 AM. The chef will be selling it by the quart also, giving the early birds an opportunity to reap the benefit! See ya' at the market.